Hello fellow WRRers, I've read a bunch of old posts regarding flatland and force rad guards. people seemed to be waiting for unabiker to make one for wrr; well, they did. but I can't seem to find any reviews on it specifically to wrr. has anybody tried them out? thoughts? good fit? good protection? easy install? the price is great and the engineering seems to be efficient. feedback please! Thanks! So I found great reviews on unabiker's products but none for their rad guard for the WRR. I decide to try it anyway; great pricing and reputation, seemed to be good reasons to do so. It was fairly straight forward install with no surprises (I am a true beginner when it comes to mechanics). I like the quality of the piece and the design with cross bars protections that other companies offer at much higher price range... other rad guards in the same price range do not feature these cross bars. I haven't crashed to test its functionality but I am overall very happy with my purchase. Could you post up a picture so others can see what the unabiker guard looks like. Along those lines....will the rad guards work with a 3.1gallon IMS? I can answer that one... the 3.1 gal ims tank has no effect on rad guards at all, so yes it will fit. Will that radiator guard work with the IMS 4.7 Adventure tank? I just bought a 2014 WR250R with the IMS 4.7g tank. The bike came with no guards on either side. Looks like there should be some sort of guard on the left side as well. Any suggestions? Saw on another thread. (facebook-wrr/x group)....that the rad guard does not nor is it needed. The left side should have a black plastic shroud covering the electronics and such in there. 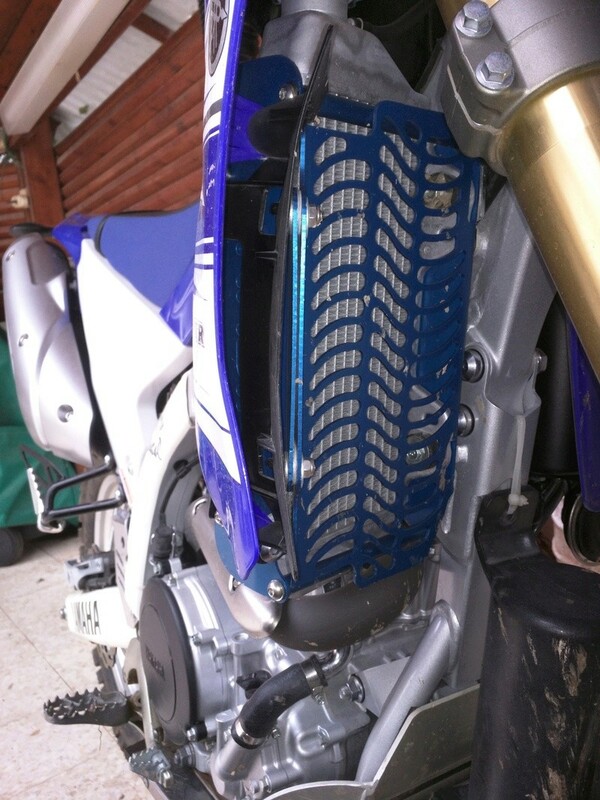 A friend of mine has Unabiker radiators guards on his DRZ. he gave me a good recommendation on Unabiker. so a few months ago I have decided to buy one... purchased it in blue color, via e-bay, for 53 USD. Overall, it looks like a good radiator guard. blue color is very nice. good fitment (I have the stock fuel tank). it comes from a well known brand. the guard itself looks rigid & tough. in addition, price is relatively low. Installation naturally require working in tight & quite unaccessible areas - so it is not easy, but it was not difficult either... it will just takes you some time. for 53$ I absolutely think this is a good deal. I would recommend this product. Those look great, thanks for sharing. $53 is an awesome price and the $60 price on Unibiker's web page isn't bad either. I originally went with Force guards on my WRR but bought Unibiker rad guards for my Beta 2-stroke earlier this year. I really like how the cross tubes in front and back of the radiator protect from side impact. 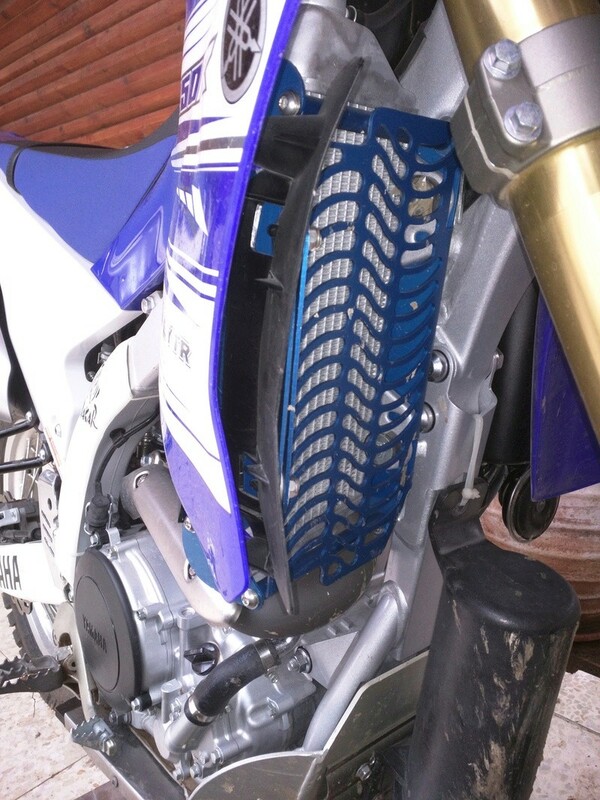 I've got no complaints about my Force radiator guard but if I had to buy radiator guards again for my WRR I'd probably look at Unibiker first. Sorry to resurrect an old thread but was wondering if anyone else has installed the Unabiker guard on their WR since the last update in this thread. I love the Unabiker design with the cross rods, but I had them for my DRZ and I was never able to get them to fit; it seems Suzuki had made some changes since Unabiker's original design that made them impossible to fit newer bikes. I'd rather not go through that frustration again. Maybe most folks here are going with the Flatland guard? Well fortunately for you, the WR has been essentially the same since 08. I don’t know of any changes made to the radiator or the mounting of it. Resurrecting this thread again. I got this for my WRR and for the life of me can't get it to fit. The pictures posted earlier above show the stock plastic fan guard in the back. But the install instructions say to leave the original fan guard off. Also, I don't see the side guard in the pictures, when the instructions say to install the side guard. Any ideas? Finally got it on. Bottom line is that it required a lot of manhandling of the brackets attached to the radiator. Needed to bend them significantly to get everything to fit, but all looking ok now. Good luck. » Best Under Sized Guards in York District?